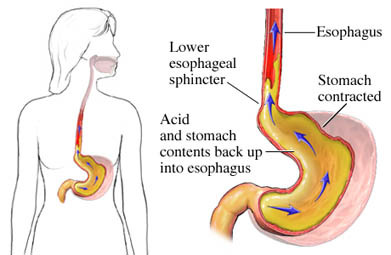 Gastroesophageal reflux (GER) is the back up of acid or food from the stomach to the esophagus. The esophagus is the tube that connects the mouth and stomach. GER is common in infants. It may cause them to spit up. Most infants outgrow GER within 12 months. GER that progresses to esophageal injury and other symptoms is called gastroesophageal reflux disease (GERD). The backed-up acid irritates the lining of the esophagus. It causes heartburn, a pain in the stomach and chest. GERD requires treatment to avoid complications. GERD can occur at any age. The lower esophageal sphincter (LES) is a muscular ring between the esophagus and the stomach. It relaxes to let food pass into the stomach, then closes shut to prevent it from backing up. With GERD, the ring doesn't close as tightly as it normally should. This causes acid reflux, a burning sensation that can be felt below the breastbone. You will be asked about your child’s symptoms and medical history. A physical exam will be done. Your child may need to see a pediatric gastroenterologist. This type of doctor focuses on diseases of the stomach and intestines. 24-hour pH monitoring—A probe is placed in the esophagus to measure the level of acid. Short trial of medications—The doctor may use the success or failure of a medication to understand the cause. If your child is overweight, your doctor will advise you on a safe way to help your child return to a healthy weight. Avoid exposing your child to secondhand smoke. Surgery or endoscopy may be recommended for more severe cases. It may be considered if lifestyle changes and medications do not work. The most common surgery is called fundoplication. During this procedure, a part of the stomach will be wrapped around the stomach valve. This makes the valve stronger. It should prevent stomach acid from backing up into the esophagus. This surgery is often done through small incisions in the skin. There are no current guidelines to prevent GERD. Gastroesophageal reflux (GER) and gastroesophageal reflux disease (GERD) in children and adolescents. National Institute of Diabetes and Digestive and Kidney Diseases website. Available at: http://www.niddk.nih.gov/health-information/health-topics/digestive-diseases/ger-and-gerd-in-children-and-adolescents/Pages/facts.aspx. Accessed March 19, 2018. Gastroesophageal reflux disease (GERD). EBSCO DynaMed Plus website. Available at: http://www.dynamed.com/topics/dmp~AN~T116914/Gastroesophageal-reflux-disease-GERD. Updated September 14, 2017. Accessed March 19, 2018. Pediatric GE reflux clinical practice guidelines. J Pediatr Gastroenterol Nutr. 2001;32:S1-S31. Treating GERD. Ohio State University Medical Center website. Available at: http://wexnermedical.osu.edu/patient-care/healthcare-services/digestive-diseases/heartburn. Accessed March 9, 2016. 5/12/2015 DynaMed Plus Systematic Literature Surveillance http://www.dynamed.com/topics/dmp~AN~T116914/Gastroesophageal-reflux-disease-GERD: National Collaborating Centre for Women's and Children's Health. Gastro-oesophageal reflux disease: recognition, diagnosis and management in children and young people. London (UK): National Institute for Health and Care Excellence (NICE); 2015 Jan 14. 34 p. (NICE guideline; no. 1). Available at: http://www.guideline.gov/content.aspx?id=48992#Section420. Accessed March 9, 2016.